This art deco building is a place to see even if you are not interested in the 300 shops located inside. The site began as an outdoor fair where carts of fruit and vegetables were sold in the 1890’s. It now holds over 300 different stores including men’s and women’s clothing, a large food court and a children’s museum. The fresh air market was converted into the city's first fruit and vegetable wholesale market in 1893. It was originally designed by the Argentine architect, Vasena, but the magnificent arches weren’t added until 1934 when it was remodeled by engineer Mr. Delpini. The building served as the most important Wholesale Food Market in South America for 50 years, but its central location became a difficult commute for delivery trucks, which had to navigate through the congested city traffic. On October 14, 1984 the Abasto Market was shut down so the new market could be located outside the city’s center. The Abasto Market was abandoned until IRSA came up with a plan to turn it into a shopping mall. 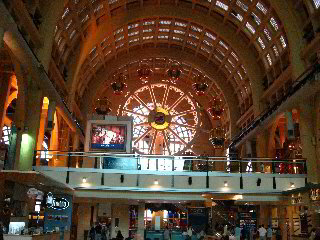 The mall was inaugurated in 1999 as ‘Abasto Shopping’. The four story building contains 300 different stores with everything from trendy clothing to gourmet kitchen ware. It has a 12 theater cinema, a large food court, an arcade, amusement park rides and a children’s museum. The food court is made famous by holding a Kosher McDonalds, and it can hold up to 1,200 people. It is open from 10 am to midnight on weekdays and stays open until 2 am on weekends. It is a great place to get just about any type of food you want. The amusement park is quite a site to see. It includes a ferris wheel which stretches from the third story past the fourth floor and into one of the famous arches of the building. The arcade includes everything; traditional car racing arcade games, ski ball, and fair like games like throwing hoops over bottles. The children’s museum is like a gigantic Wanna-Do City. Kids can pretend to be grown-ups, live in a scaled down city and choose a profession. Kids can take a ‘tram’ to their job site which may be a construction zone where they operate a crane, a TV studio where they can act, direct or film, or a ship which they can navigate through the pacific ocean. The shops at the Abasto Shopping Mall are open from 10 am to 10 pm seven days a week.